Stops disputes before they begin! The Rules of Eight-Ball Poster is a beautiful work of informational art and our only non-musical poster. The painting, “Who’s Next?” by artist Robert Butters (who also did the artwork for the Guitar, Keyboard, Rock Guitar and Saxophone posters), depicts an 1890’s billiard parlor when pool was known as a “gentleman’s game.” A portrait of Mark Twain, the era’s most enthusiastic player, observes the game from the wall. 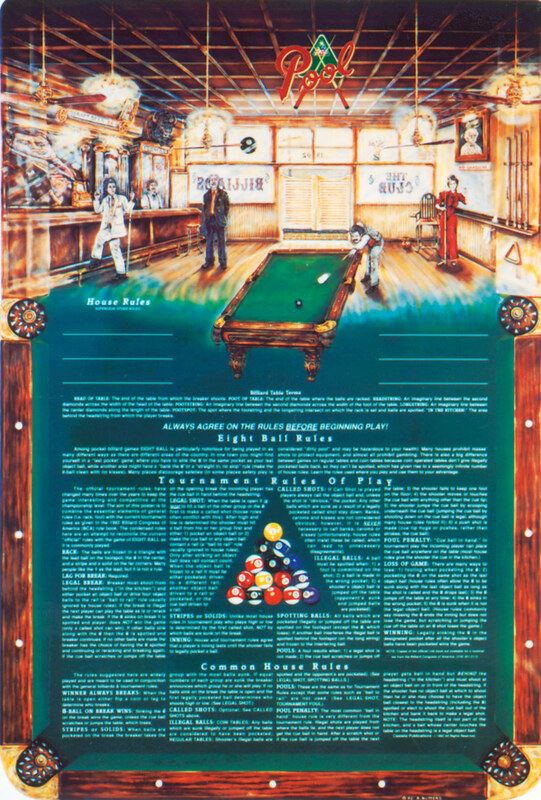 The Rules of Eight-Ball Poster explains common billiard terms and the game of Eight-Ball and why there are so many variations in the rules. It fully details the “official” Billiard Congress of America tournament rules as well as the most common “house rules” and explains how they differ. This beautiful piece of functional art will tastefully decorate any pool, billiards or recreation room and stop disputes over the rules before they ever begin.